Journey to the City of Gold for a chance to uncover ancient relics and treasures beyond belief. Click here to play! As you will be scouring thick jungles for the lost City of Gold, you’ll want to keep your eyes peeled for any sign of gold. Golden pots hold the highest payout available in this classic 3 reel game. Three golden bowls filled with treasure will fetch up to 1600 coins. They are also a wild symbol that will replace all other symbols to help you bring in even more wins. If you can collect three lucky sevens while searching the jungles you’ll get up to 200 coins. There are also triple, double, and single BARS, and don’t forget the watermelons. All of these will bring in wins if you can line them up across the single payline. This slot game accepts a max of two coins the value of which is adjustable. 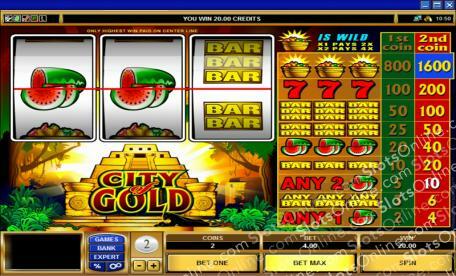 Bet max if you want to activate the highest pay table and score all of the biggest payouts on offer at the City of Gold. The golden bowl of treasure is a wild symbol. It will substitute for all other symbols to help you bring in more wins. It will also multiply your winnings by 2 or 4 if you spin one or two in a winning line.